Can Eating Chocolate Make Your Throat Burn? Chocolate is made from cocoa solids, which comes from the beans of the Theobroma cacao plant. Cocoa solids contain flavonoids, which are health-promoting antioxidants. Dark chocolate is 60 percent or more cocoa solids and contains little calorie-rich sugar; for these reasons, University of Michigan considers dark chocolate a healthy dessert when eaten in moderation Unfortunately, some people feel a burning in their throat when eating chocolate as a result of gastroesophageal reflux, also called heartburn. The heartburn and burning throat that you might experience after eating chocolate is a result of a reflux of some of the stomach contents into the throat. The contents of the stomach are very acidic and can damage the throat lining, causing a painful burning sensation. If this reflux happens twice a week or more, you may have gastroesophageal reflux disease, or GERD. The main symptoms of GERD is burning in the throat and chest, but other symptoms sometimes occur, such as a dry cough, bad breath, tightness in the throat or chest pain. Chocolate can cause isolated instances of heartburn, but it is not the primary cause of the chronic heartburn associated with GERD. While the definitive causes of GERD are unclear, the National Digestive Diseases Information Clearinghouse reports that pregnancy, smoking cigarettes and obesity are significant GERD risk factors. In addition to chocolate, other foods that can trigger instances of gastroesophageal reflux are alcohol; citrus fruits like oranges and lemons; foods high in fat; onions and garlic; and spicy or tomato-based foods like chili. Chocolate can cause the throat to burn because it contains two heartburn-triggering substances: theobromine and caffeine. Because dark chocolate has a higher content of theobromine- and caffeine-containing cocoa solids than milk chocolate, 1 oz. of dark chocolate would have a more potent heartburn-causing effect than 1 oz. of milk chocolate. 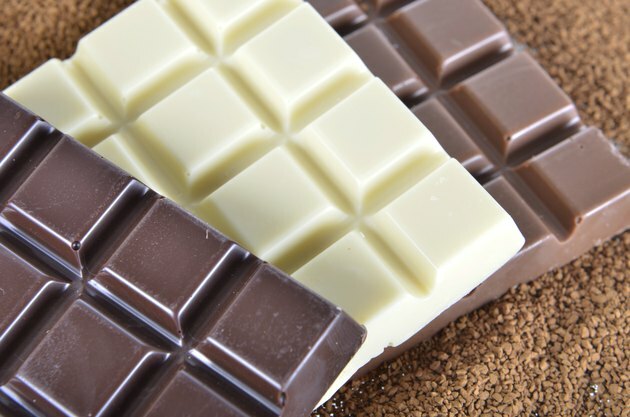 If chocolate is causing your throat to burn, UCLA notes that the best way to avoid this pain is to avoid eating the substances that cause the heartburn symptoms for you, including chocolate. There are also various over-the-counter and prescription medications that target heartburn in different ways. Consulting a pharmacist or doctor is a good way to find out which medications might be right for you. Can Spearmint Gum Cause Acid Reflux?